This bulletin has been a month in the making. It has been a great experience for us. Our initial goal was to produce a “brief” analysis of the election results. But our systems perspective made us look at many more things than we anticipated. After all our Indian election work encompassed two Congressional briefings. Hence, this effort too has been more comprehensive than our initial estimate. Besides our keen interest in American politics there were two reasons that inspired us to create this publication. One is our desire and passion to share a holistic view of democracy with others. One of the main reasons for Young India’s existence has been to push forward an approach to politics that sees the linkages between disparate issue areas and then ties them to release the energy through new synergies. We want to share our vision of a creative politics that is progressive and beneficial to the people on whose efforts democracies have been built and are sustained. To achieve that we have to look at issues in their totality, free of ideology and prejudice, dedicated to the greater common good. The other reason for sharing this analysis with you is to bring out some of the parallels that exist between Indian and American democracy. Recent history has made this comparison even more important. The cultural shifts in both societies have impacted the polity of both nations. We have tried to capture some of those changes and contrasted them here at a high-level. This document is just the starting point in our parallel study. We hope you find it useful. 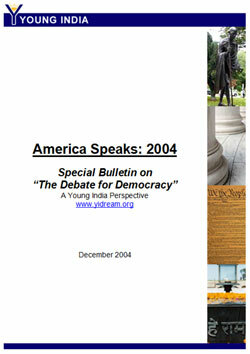 © 2000-2007 Young India, Inc. All rights reserved.